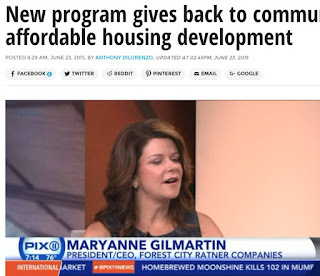 Forest City exec hopes for 8-year buildout, likens open space to Chicago park 3X larger; WPIX claims affordable housing "gives back to community"
A softball Bisnow interview with a Forest City Ratner Executive VP, SUSI YU ON AFFORDABLE HOUSING: INNOVATION IS IN OUR DNA, has a couple of interesting moments, including comments on an aggressive timeline, a comparison to a real park, and something left unsaid. When the Bisnow interviewer asks about a 2025 deadline for the affordable housing, Yu responds, "We’re hoping that it’s really an eight-year timeline, but we’ll see. If we have another financial crisis, you just don’t know." An eight-year timeline would mean 2023, so stay tuned. 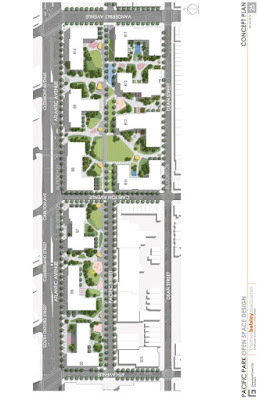 I think the eight acres of open space are going to be an incredible public amenity. Brooklyn is all about trees and openness, parks and playgrounds. We really think that eight acres of open space that we’re designing with Thomas Balsley is more like Millennium Park in Chicago, where we’re going to have a lot of activation that’s part of the park that sort of recognizes the fact that urban dwellers use open space and parks in a different way than it was designed in the 18th century. some public gathering areas. No residential towers. Yes, as Yu suggests, park design has evolved, and thus the open space for the Brooklyn project can draw on the lessons of places like Millennium Park. But her comparison is a tad aggressive, because even landscape architect Balsley himself, when asked, could not suggest an analogue. After all, Millennium Park is is three times the size of the open space in the Brooklyn project--more than 24 acres--and does not have ten residential buildings inside its perimeter--or creating its perimeter. It doesn't have any such towers. It's also a public park, not privately managed, publicly accessible open space. It was a project that was in its incubation stage for a long time. I do think all of that is behind us and what we face is trying to build as quickly as possible, and also build the type of development that embraces the aesthetic of Brooklyn because I think building in Brooklyn is very different than building in Manhattan. So we can’t land a glass tower in Brooklyn in such a strong brownstone neighborhood. We’re very cognizant of building buildings that fit the aesthetic that really does exist in Brooklyn. Yes, they have chosen masonry and brick for the buildings on the southeast block, which are still far larger than their neighbors. But does the design for 461 Dean Street (above), aka B2, in any way reflect the "Brooklyn" aesthetic? I think that workforce housing has not really been created in the last 20 years in the city and I think the administration’s shift to create a more diverse income band in the mandatory and inclusionary 421a is the right step. Having a mixed-income with market rate is really important for the socioeconomic diversity of New York City. It’ll make the city a much more vibrant and richer place to live. Pacific Park has 35% affordability blended across 40% to 160% AMI. I would say the city sort of caught up to it because we’re the first ones who did 30% affordability. And that’s where the new wave of entitlements that you see that’s occurring, that’s even in the mandatory inclusionary zoning and in the 421a legislation, where they’re upping the affordability to 25, 27, 30%. Of course they also proposed 50% affordable housing, and got a huge increase in development rights, as well as other government help in response. Note that Yu avoided talking about the viability and plans for modular housing, which some three years ago was Forest City's proud innovation. 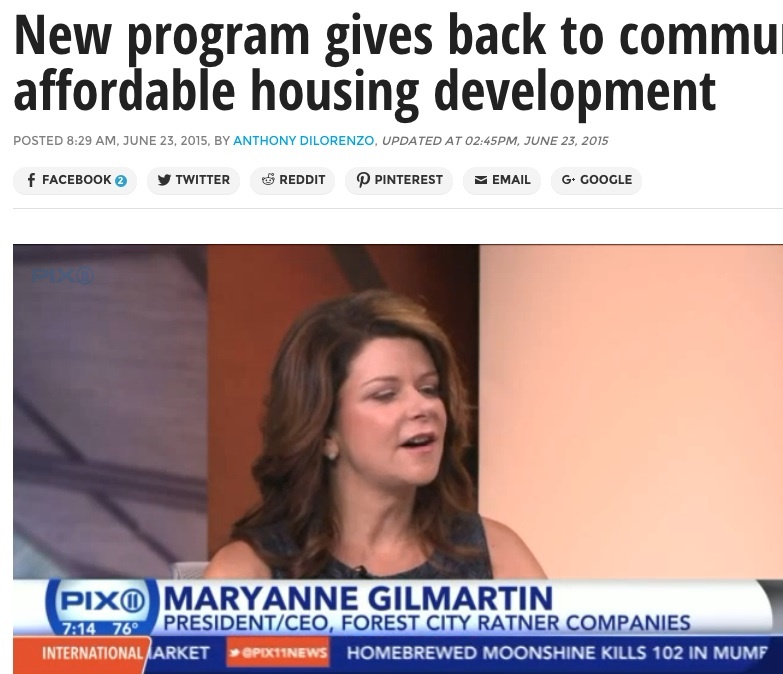 I missed this PIX11 6/23/15 coverage, an anodyne interview with Forest City Ratner CEO Maryanne Gilmartin with a very promotional headline: New program gives back to community with affordable housing development. No journalistic effort is expended to explain that the program does not "give back" but was part of a deal in which the developer got an override of zoning to build far bigger than previously allowed, and that the below-market units rely on subsidies, tax breaks, and below-market financing. Gilmartin describes "a whole wide range of housing stock" aimed at low-, moderate-, and middle-income households, as well as luxury units. Actually, of the 6,430 apartments, there would be 1,930 condos and 4,500 rentals, of which 2,250 would be "affordable," below-market, but many of them would be not so affordable. Gilmartin cites "four vertical buildings" under construction, with 900 units, 600 of them affordable. Actually, her number encompasses three buildings, two front-loaded "100% affordable" buildings (B14, 535 Carlton Avenue, and B3, 38 Sixth Avenue) and a condo tower (B11, 550 Vanderbilt Avenue), not acknowledging a fourth building under construction at the time, a 50% affordable, 50% market building with 363 units (B2, 461 Dean Street). Beyond that, two additional 100% market buildings are in process today, one with condos (B12, aka 615 Dean Street), the other rentals (B15, aka 37 Sixth Avenue). "We're delivering a large number of affordable units over a very wide spectrum of incomes," she says, not so precisely. "How is this going to be affordable?" the anchor asks. "So I think if you were building a neighborhood from scratch, this is what you would want to do, which is mix a highly diverse group of individuals and create a real place," responds Gilmartin, again with that unironic use of Frank Gehry's notorious "neighborhood from scratch" quote. "So, because of that, we have families of four, that are making well below the Area Median Income, which is how housing prices are defined when you talk about affordable." No numbers are supplied, of course. "So families can live here," she continues. "Families that are low-wage earners. Families that are working class, families could live here as well. And then we have luxury housing. So I think within one particular building, you can have a wide range of incomes. And I think it's not just low income, I think for all of us in New York, to get close to the urban core, to live where all the action is, it's very, very expensive, and this this project's goal is to create more options for people." That's another part of the mantra, pointing out that, well, even if the housing's not so affordable, at least it's close to the "urban core." Yu on Forest City: beyond "white Jewish men"
I have to tell you, it’s amazing being in an industry that’s dominated by white Jewish men, and I go to work every day at Forest City Ratner Co, where my CEO is a woman who hired me, and who is not a relative of the chairman of the board. A lot of the key executives all across the different departments, they’re all women at high level and I think it speaks to Bruce’s ethos and MaryAnne’s ethos on giving opportunity to the best, those who strive the hardest no matter what the race, creed or ethnicity is—just the fact that I am a Korean-American immigrant with an architectural background who has been given the opportunity.